Taking advantage of a lull, today I have been testing some tools related to Twitter that appear daily on the network. 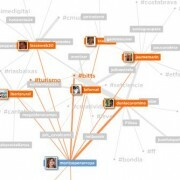 Among them I found Mention Map, Used to see a visually mentions your network (people you mentioned). The image attached is my network of mentions. 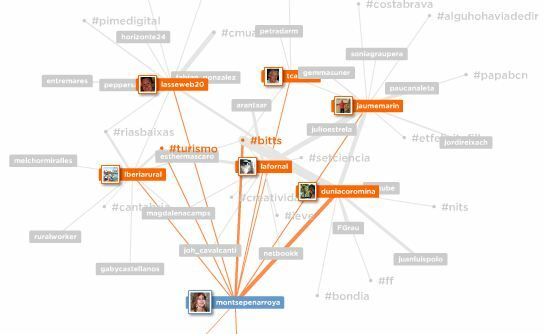 That is, I have asked Mention Map to analyze my own (@montsepenarroya). As we see in the image also shows hashtags related to conversations that refer to my account. But the tool may have other utilities, for example to find people who mention your competition (depends on the twitter user you instruct for analysis). Or what hashtags they are linked to the topics covered your competition ... this way you can try to publish more content related to these tags and get to draw attention to your account, people who otherwise would be reading the twits from your competition. It seems to me that it is a useful tool for both both to analyze the image that you offer, to get new audiences. I hope you also find it useful.